Health care REITs have huge upside, but you should consider the risk before buying. When you spot a great opportunity, it's easy to overlook the downside. One such instance exists in real estate investment trusts Senior Housing Properties (NASDAQ:SNH), Sabra Health Care (NASDAQ:SBRA), and HCP (NYSE:HCP), all of which offer a big dividend and the chance to cash in on an emerging trend. These REITs own and lease portfolios of healthcare real estate, such as senior housing and skilled nursing facilities. According to the Administration on Aging, the population of those 65 and older is expected to more than double -- from 45 million to 98 million -- over the next 45 years, which should create plenty of opportunity for these companies. Also, as REITs, these companies receive hefty tax breaks in exchange for paying 90% of their taxable income toward dividends. 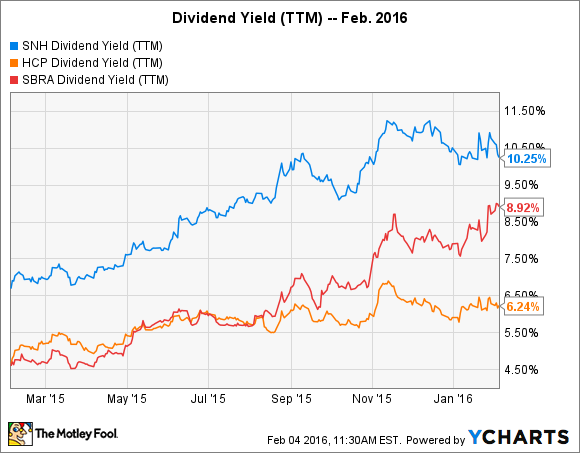 This approach leads to some of the highest dividend yields. However, despite what looks like an obvious home run, there is a substantial amount of risk with these companies that you should consider before buying. One significant risk for the $3 billion Senior Housing Properties is the company's management structure. Starting at the top of the chart, over the past five years, Senior Housing Properties has doubled its assets. This performance has doubled the company's general and administrative fees, yet shareholders have seen their dividend per share grow by just a measly 5.4%. Remember, REITs are required to pay out 90% of taxable income toward dividends. 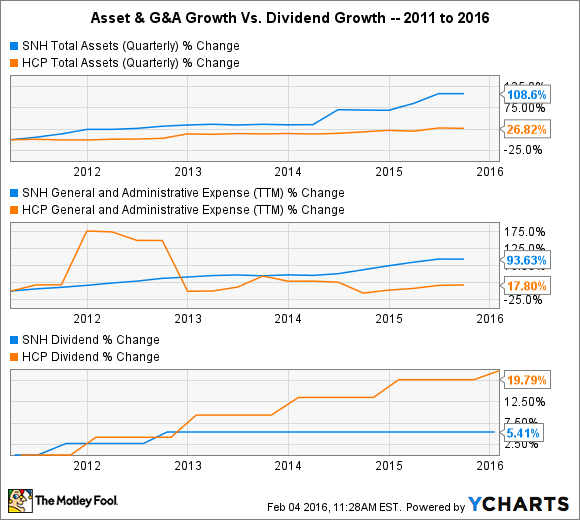 So if the dividend isn't growing, then earnings per share aren't growing. Whether or not the potential conflict of interest is to blame, it's worrisome to see a company rapidly grow assets without any meaningful improvement to earnings per share. Sabra Health Care may not have management issues, but one of the $1.2 billion company's more notable drawbacks is that it depends on government reimbursements from programs such as Medicaid and Medicare. Here's a quote from the company's 2014 annual filing: "Revenues from government reimbursement have been, and may continue to be, subject to rate cuts and further pressure from federal and state budgetary cuts and constraints." This lack of predictability is why many healthcare REITs attempt to focus their portfolio on tenants that create their income through more reliable private-pay sources. As of November, 47% of Sabra Health Care's revenue was dependent on government reimbursements. For comparison, 14% of HCP's rent, and just 3% of Senior Housing Properties' revenue, relies on tenants depending on government reimbursements. Finally, all three companies are highly dependent on one tenant. There are only so many large healthcare operators to choose from, so this is a common occurrence. But it does leave these companies vulnerable to having one tenant damage earnings by way of that tenant's loss or underperformance. One way to judge a tenant's financial strength is with a fixed-charge coverage ratio. The metric identifies how much cash flow the tenant is generating above its fixed expenses, such as rent. A ratio of 1.00 means the company is earning exactly enough to cover fixed expenses. The higher the figure is above 1.00, the better. An appropriate coverage ratio will vary by industry, but for healthcare operators, a ratio of 1.20, or 20% above fixed costs, is considered fairly safe. However, even at that level, it doesn't leave much wiggle room if these tenants' earnings fall. In March 2015, this risk became real for HCP. The coverage ratio for its top tenant, HCR ManorCare, fell below 1.00, and HCP was forced to reduce its rent by $68 million per year, or 13%. As a $16 billion company, HCP will survive the loss of rent. But HCP also has a 9% equity interest in HCR ManorCare, and with the tenant's coverage ratio still low, it's possible that HCP will have to reduce its rent again. Are healthcare REITs a bad investment? I think all three of these companies have the potential to be great investments. In particular, my opinion about HCP hasn't changed since I recommenced it last September. But it's helpful to know where you're likely to get burned. With that in mind, if you decide to buy, or currently own, one of these companies, you'll want to keep a close eye on these risks.